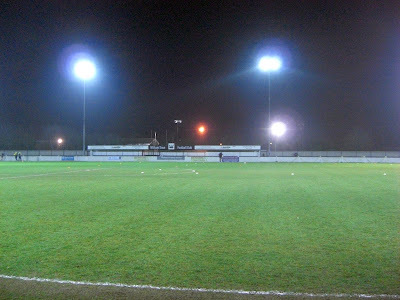 My ninth stadium of 2011 was on Tuesday 15th February 2011 at Spa Road in Witham, Essex. The match was Witham Town vs. Enfield 1893 in the Essex Senior League. Spa Road (also known as the Spicer McColl Stadium) is located in a sports complex on the western edge of the town. It sits just 100ft from the railway line and is just under a mile from Witham railway station. The ground has been home to Witham Town since 1975 when they moved from their previous stadium known as The Park. Spa Road has a single all-seater stand which is located level with the half-way line on the west side of the ground. This stand is fairly compact but is able to hold 150 fans. The remainder of the west side of the stadium is uncovered standing behind the brick wall which goes all the way round the pitch. 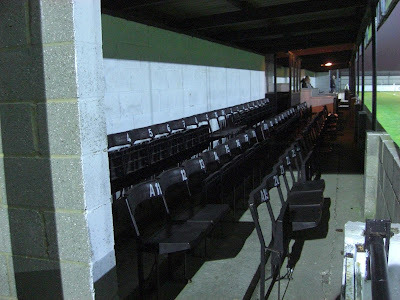 The areas behind the two goals are both covered standing on raised concrete and when I visited the ground, the club were in the process of adding the same covered standing to the east side of the ground. Also on this side of the ground are the main facilities including the social club, food outlets and car park. The game was a torrid affair with heavy rain making the pitch very tough to play on. The quality of the game was poor from start to finish with Enfield 1893 grabbing the advantage with two goals in the space of five minutes either side of half-time. Witham Town got a consolation goal towards the end of the match but Enfield 1893 were the deserved winners on the night.